Today (Friday), is another Chalk Off Challenge in Frost Park at 9th and Pacific Avenue at Noon. Everyone is welcome. Last week, there were 10 entries. Last week, RR Anderson narrowly prevailed with his chalk art piece "Tagro" over Lance Kagey's Warhol by a vote of 7 - 5. LupinGoddess, aka Andrea, the winner of the first chalk off challenge has vowed to reclaim her title as the "Best Illustrator in the World of Tacoma." reclaiming her title in Frost Park against RR Anderson. A schedule conflict and my own uncertainty as to whether or not the contest would still be held under adverse weather conditions prevented me from attending April 18th's showdown. 19 percent chance of rain. Yet, it is just after midnight and clear outside. I expect good weather. Yet, even if it rains, the Frost Park Chalk-Off will still take placa as there are a number of chalking surfaces there impervious to the weather. The winner of the Frost Park contest tomorrow will receive a coupon for a large pizza at Puget Sound Pizza, this week's sponsor, no strings attached. We are making them up as we go. However, the contest starts at 12:00 noon and ends at 1:00 p.m. Please vote for your favorite chalk art entry in the comment section below. Each person/avatar gets one vote. Votes will be accepted until midnight on Friday after which the winner will be declared. by Erik on 4/25/2008 @ 1:03am Oh my. 504 hours ago a call-to-action was issued challenging "artists" to arise in the sucking chest wound of Downtown's own LARRY FROST MEMORIAL PARK. For the audacious creator, this is your chance to literally draw upon the publicly funded resources of the City--Literally the City of Tacoma itself is your canvas. WIN A PRIZE(S), COMPLETE DOCUMENTARY PHOTO SATURATION, FAME, GLORY, escapist COMPANIONSHIP FOR 1 HOUR! A MAJESTIC SPECTACLE FOR THE UNINSPIRED CIVILIAN! by Erik on 4/25/2008 @ 11:25am 11:24 a.m. Sunny downtown at Frost Park. by NineInchNachos on 4/25/2008 @ 11:48am I have butterflies in my stomach. The sky is opulent with sun beams. My digital camera is at full charge. by Dave L. on 4/25/2008 @ 12:13pm Man, Iâ€™m missing the chalk-challenge, and I really wanted to witness the fierce competition. But I can feel the tension from afar. (Maybe a live web-cam for future showdowns?) To make up for my own lack of chalk-skill and imagination, Iâ€™m working on new chalk-technology for the next challenge that Iâ€™m able to attend. Canâ€™t wait to see todayâ€™s results and RxRâ€™s severed head. by NineInchNachos on 4/25/2008 @ 1:30pm we all missed you dave! it was a good one. by Erik on 4/25/2008 @ 2:37pm Ok. Time to start voting. 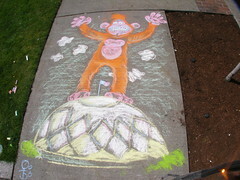 Who won this week's Frost Park Chalk Off Challenge? by AP on 4/25/2008 @ 2:42pm Gimme an "R"! Gimme another "R"! by thriceallamerican on 4/25/2008 @ 2:48pm I vote Lance, even though (at the current moment) his picture doesn't seem to be showing in the above post, and I had to go find his drawing on your Flickr page. Who escaped from the Nalley Valley, for their lunch break. by Erik on 4/25/2008 @ 2:53pm Its between LupinGoddess and Lance this round for me. Andrea did some pretty spectacular work with color and blasting white light from the Museum of Glass. The stars effect with chalk was nice. The best effect was the reflecting of the blasting white light off of the clouds which comes out pretty well. The chalk art contest game got picked up a bit. So difficult to decide. A mere 8 hours and 5 minutes left to vote. BTW, Patricia from Embellish Salon with be next weeks sponsor. by thriceallamerican on 4/25/2008 @ 3:05pm I would just like to add that Izenmania would have had my vote had he just captioned his drawing "Rock out with your chalk out". In fact, can I win the contest just for coming up with a funny caption after the fact? Mmmm...pizza. by Dave L. on 4/25/2008 @ 3:17pm WOW!!! Those are great! I hope us mortals are still welcome to come to these! But my one vote is split between Lanceâ€™s perfect blending of subject, message, color, perspective, and dramatic statis, and Lupinâ€™s perfect blending of subject, message, color, perspective and dramatic action. (I want lithos of both to frame.) O.K., Lance can wait another week - I have to cast my vote it in slight favor of the Lupin Express. I have to vote for my son's, but sadly no one took a photo of it..
by Erik on 4/25/2008 @ 3:36pm Was this it? Oh, and here is Stowe's Blog, which I left out before. by NineInchNachos on 4/25/2008 @ 3:53pm Ms. Darcy votes for Lance, I'd vote for Lance but I need all the help I can get this round so I vote for myself. We really should start a new post for these things as the little pics in the comments don't do justice to the hard work these artists pump into the concrete. by NineInchNachos on 4/25/2008 @ 3:57pm The orange monkey was awesome. Also special points for Izenmania for manning up and claiming an actual square. kevin will probably have some good ones too. by izenmania on 4/25/2008 @ 4:03pm I chose not to let The Man (RR) dictate the directional orientation of my square. by Erik on 4/25/2008 @ 4:03pm 15 minutes into it I had thought I was going to vote for the Lance's MM Bridge. It a great piece. The bar certainly got raised. As good as it is, I have seen the MM Bridge a number of times in similar pieces, so I have to give the originality component to Lupin. The MOG piece also has a transcendental component linking Tacoma to the heavens and some action to it. Thus, I submit my vote for LupinGoddess. Looks like its going to be a squeaker. by Elle on 4/25/2008 @ 4:18pm No the boy's was on the side of a wall and you would have to ask him his interpretation of it, because it may have been a cow. As for my own vote...I am always impressed with the other contenders. I am taken with LupinGoddess' true sparkle effect without the use of actual glitter but like RR I will have to vote for myself. by justagirl on 4/25/2008 @ 4:18pm I gotta say, the photo doesn't do justice to Elle's Tacoma Gardens effort. To truly appreciate, you gotta check out the in-progress photos or see it in person. The others seem to photograph better ... but the prep work that went into this one was impressive ... love all the lines. by Erik on 4/25/2008 @ 4:22pm I'd vote for Lance but I need all the help I can get this round so I vote for myself. I am taken with LupinGoddess' true sparkle effect without the use of actual glitter but like RR I will have to vote for myself. There's something I like about the bravado of Tacoma artists voting for themselves. Perhaps this signals a much needed future increase of the collective self esteem of the City of Tacoma. by Lance Kagey on 4/25/2008 @ 4:24pm I vote for the orange monkey. nice work. by NineInchNachos on 4/25/2008 @ 4:26pm It's not bravado... it's free PUGET SOUND PIZZA lust. by Dave L. on 4/25/2008 @ 4:32pm Dang, NOW I think of it - Could I have sold my vote for a slice of pizza, RxR? Looking at the others' now in more detail; amazing stuff. But I am still awed at Lupin's ability to transform chalk dust into a light source. by Erik Hanberg on 4/25/2008 @ 4:42pm I'd like to vote for the monkey. He's awesome. Also, what the position on RCV voting? Too complex for sidewalk chalk contests? by jenyum on 4/25/2008 @ 4:55pm I also vote for the monkey. But this was a tough one. by Elle on 4/25/2008 @ 5:23pm I've been known to sell my soul for a beer so pizza isn't that far off. by KevinFreitas on 4/25/2008 @ 5:33pm I gotta vote for Lupin's blazing cone. Just beautiful with great motion about it. by Adam the Alien on 4/25/2008 @ 5:45pm *whines* I still can't deciiiiiiiide! The drawings this week were all amazing...it's not an easy choice at all! I do think, though, that the Hulk drawing should at least get some kind of honorary title for not steering clear of non-cement areas. Everyone else kind of stayed within their bounds, but that drawing said, "Bricks? Hah! Hulk laugh at puny bricks! Hulk SMASH puny bricks! ...And by that, of course, Hulk means Hulk draws over puny bricks with chalk." I'd like to see a lot more challenging of specific boundaries in the future. Let the drawings blend together and spill out of their boxes! Go over the bricks! Use the wall and the ground as one, where possible! I'd also like to see people stop leaving things in the park, however. I know someone's umbrella was left behind once, and today I picked up the remains of various sizes of chalk, an an unidentified little gadget thingie, as well as some litter (which, yes, I am 100% certain was left by FeedTacoma folk, sad to say). by ixia on 4/25/2008 @ 5:53pm my # one goes to Lance - we love the Murray Morgan. # 2 for orange monkey - for an orange monkey kinda town! by jcbetty on 4/25/2008 @ 7:46pm I have to add my vote to ixia's(and pietogo's); the bridge, its simplicity and perspective, his rendering of it, and the text.... so goooooood. I had a sense of "heart full of good stuff" today, at Frost Park, because there was so much chalk-art energy, so much good stuff rendered in that ephemeral (gah, I'm coming to hate that word) medium, and there was just a really crazy-cool "networking meets random acts of art meets friends talking and digging each-other, and new friends meeting" energy that made me kind of twitch in a really good way. by Maggie on 4/25/2008 @ 7:58pm I vote for Elle's Tacoma Gardens. by Erik on 4/25/2008 @ 8:06pm Ok. Its 8:06 p.m. Less than four hours left to vote for the "Best Illustrator in the World of Tacoma" and for the recipient of the prize sponsored by Puget Sound Pizza. The voting is coming out extremely close. Obviously, drawing a toilet on the sidewalk isn't enough to win it this week. Here are the photo sets that are currently available to review for the last minute decisions. Ms. Darcy votes for Lance, I'd vote for Lance but I need all the help I can get this round so I vote for myself. Thus, Ms. Darcy is certainly entitled to vote, but needs to do so under her own avatar rather than by proxy. by tacomachickadee on 4/25/2008 @ 8:30pm I need me some RCV. 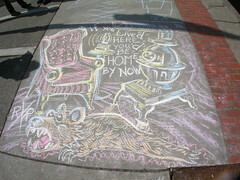 by jamesstoweart on 4/25/2008 @ 8:54pm Man, who knew that chalk drawings would create such a nailbiting neck to neck to neck to neck showdown. I am the monkey artist. By my count we are tied. Karma be damned I am VOTING FOR MYSELF!!! I mean honestly, PIZZZA is involved. Next week I'll vote for someone else. I promise. by Room To Grow on 4/25/2008 @ 9:33pm I vote for Elle's Tacoma Gardens. Plus I think she's cute. by ALT on 4/25/2008 @ 9:41pm Well, I'd like to win (who the hell wouldn't want a free pizza? ), so I can't logically vote for my competitors. At the same time I can't bring myself to cast a vote for my own piece, so I've decided to abstain from voting. So no rocking the vote here. Whenever I find myself unable to participate however I certainly will voice my fav. Wait, is that allowed? Can you vote for yourself? Isn't that against the Chalk Artist's Union Oath? With honorable mentions to: IF YOU LIVED HERE YOU'D BE HOME BY NOW, I WANT TO GO TO THE ZOO, and HERE I STAND I CAN DO NO BETTER. Thanks Morgan for weighing in. However, if you want your vote to register toward the final result, you have to select one of the contestants who you believe overall prevailed as difficult as that might be. by Heather on 4/25/2008 @ 10:28pm "If you lived here, you'd be home by now" was good. Really good. But I have to vote for the *Tacoma Gardens, "Cultivating Community. "* Loved it. How did I miss the snacks from Woody's? Bad timing...as usual. by Heather on 4/25/2008 @ 10:33pm Oh, wait. The bridge was really great too. Can I vote for 2? by Erik on 4/25/2008 @ 10:52pm Oh, wait. The bridge was really great too. Can I vote for 2? I need me some RCV. Just one vote is allowed. by tacomachickadee on 4/25/2008 @ 11:19pm We so need categories. Until then, I vote for Elle & Tacoma Gardens ... a worthy illustration, and a very worthy topic. by Erik on 4/26/2008 @ 12:11am Looks like Elle won with "Community Gardens." A record number of participants with 22 votes cast. by Adam the Alien on 4/26/2008 @ 12:22am Oh, dang, I lost track of time. I had finally decided on RR's, too, because it kept reminding me of some Charles Addams drawings I've seen. But it seems my vote wouldn't have pushed him even into second place, so ah well. That's what I get for thinking "I've got until midnight to vote" and completely glossing over the occurrence of midnight.